St. Mary’s is positioned on a 40-acre campus surrounded by woodlands to the south and west. 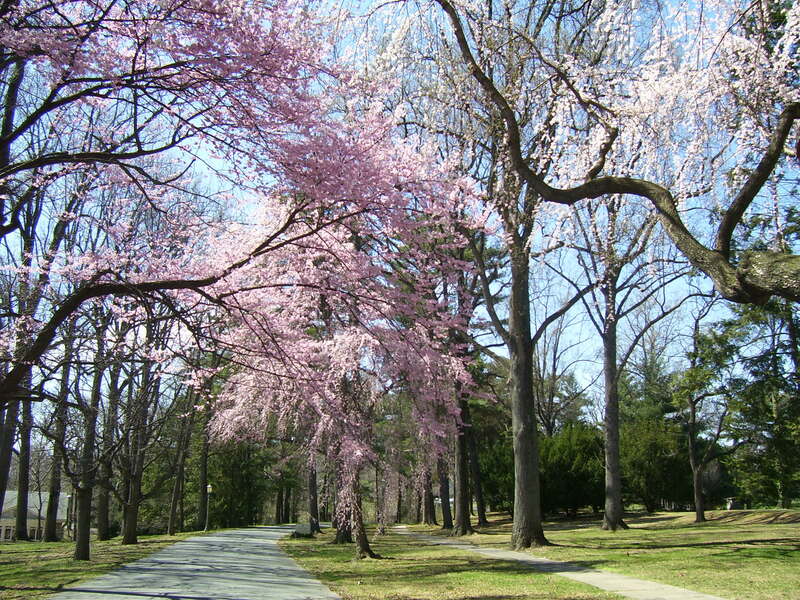 An expansive and stately great lawn leads up to the main entrance and a long winding drive is lined with large oaks and elms. 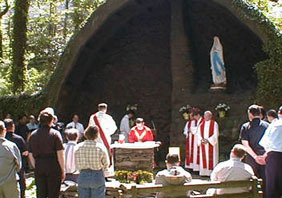 Nestled in the wooded grounds to the west is a beautiful Marian grotto. 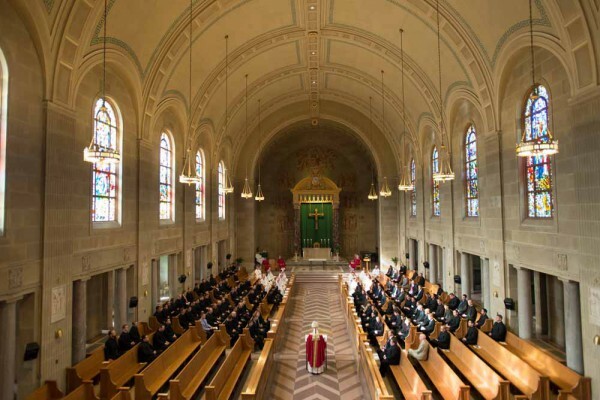 The Chapel of St. Mary’s Seminary and University is dedicated to Mary’s Presentation in the Temple, the patronal feast of the Society of St. Sulpice. The seminary classrooms are just down the main corridor from the chapel and dining room. The classrooms are large, bright, classic spaces. High-tech classrooms with LCD, Internet, and other computer-assisted teaching options are used for instruction. St. Mary’s Seminary & University’s library traces its roots back to the collection of theological and philosophical works that the members of the Society of St. Sulpice brought with them from Paris in 1791. 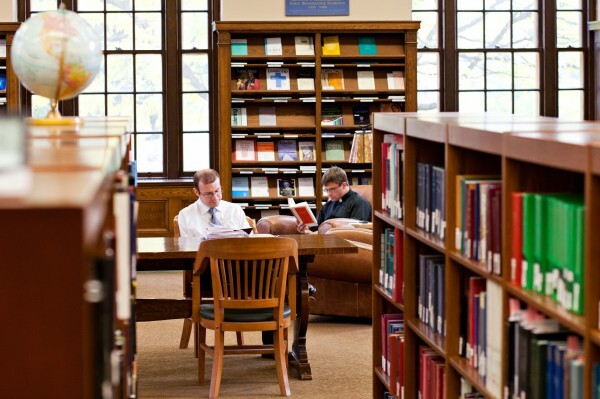 Today the Marion and Henry J. Knott Library of St. Mary’s Seminary & University has a collection numbering over 140,000 volumes. The collection is primarily of a philosophical and theological nature; approximately 20% of the collection is in foreign languages, including a substantial rare books collection. 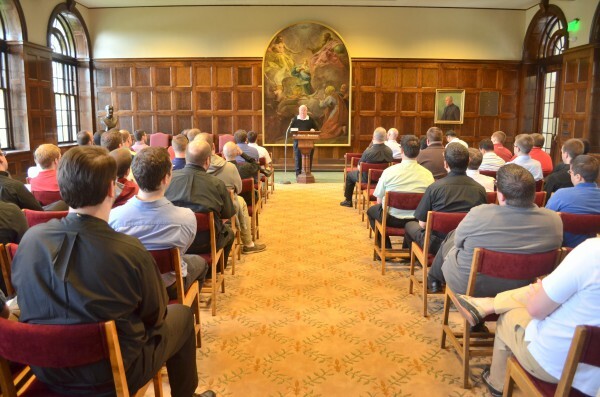 Laubacher Hall is the seminary’s major reception and lecture hall adjoining the chapel and dining room. Here the seminary holds occasional socials, rector’s conferences, and public lectures. It is appointed with comfortable sofas and a large table for daily newspapers. The main dining room is spacious and comfortable. Paneled in oak, with stately columns and surrounded by large arched windows, it’s a perfect setting for meals and socializing. Meals are served buffet style and include an ample soup and salad bar, hot coffee, dessert and frozen yogurt bar. Menus are varied and a healthy diet is considered essential. Coffee is always available for quick breaks between classes. Seminarian and faculty rooms are located on the third and fourth floors of the building in four wings. 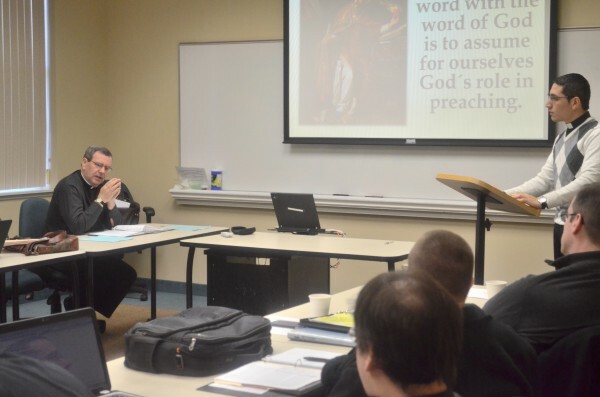 Each seminarian has his own private room equipped with a telephone, computer connection for free e-mail and internet access, and cable TV. 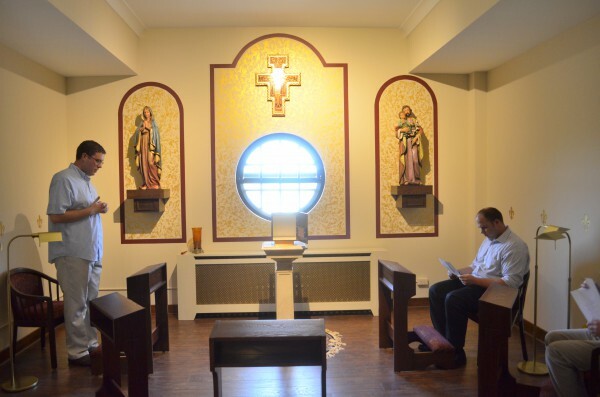 Each residence hall has a private prayer chapel. 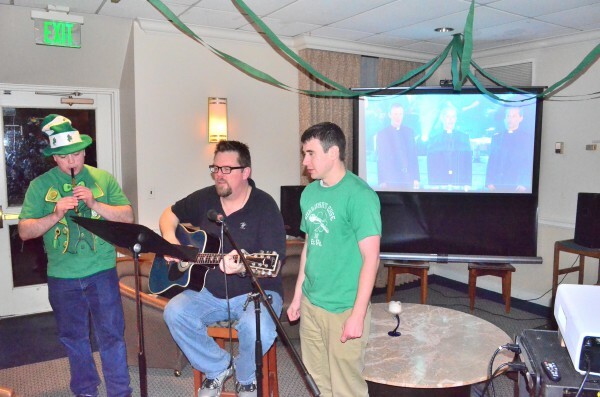 The Donnelly Lounge is the seminarians’ primary community social center. It is equipped with a bar, large screen TV, and comfortable seating. The lounge opens onto a brick patio and garden for outdoor socials and just a quiet place to read and be alone. Fitness and athletics are important at St. Mary’s. The seminary has a modern climate-controlled Fitness Center with treadmills, stationary bikes, an elliptical cross-trainer, nautilus machines and free weights. A short walk away are outdoor tennis courts and a modern track for jogging. 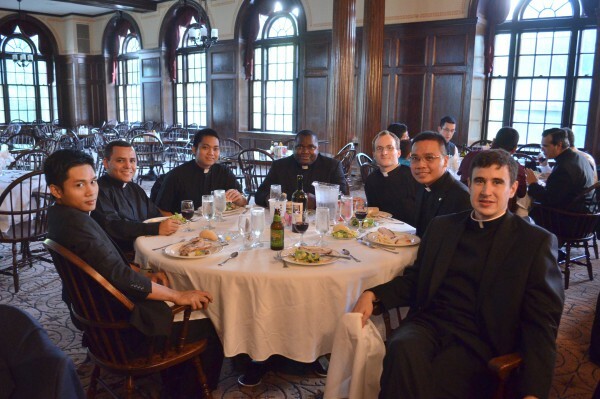 Seminarians and faculty also use the indoor basketball courts, racquetball courts, tennis courts, and Olympic sized pools at Gilman School and Loyola University a short walk away. A USGA artificial turf practice facility is also located on campus. Intramural sports on campus include basketball, softball, and volleyball. A number of excellent golf courses are available nearby for golfers. The seminary also features a small outdoor putting green to develop the short game!